Over the course of seven books and eight movies, the Harry Potter series has transported readers into a magical world. Universal Studios has sought to make at least part of that world into reality with The Wizarding World of Harry Potter in Orlando, Florida (and soon in Los Angeles as well). The first park, within the Islands of Adventure, opened to the public on June 18, 2010, and allows park guests to walk throughout the shops of Hogsmeade and into the Hogwarts castle. 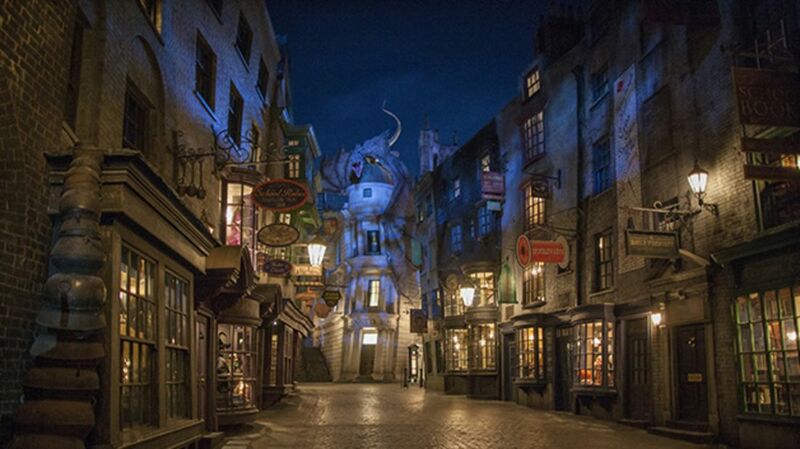 Four years later, a second immersive park opened: Diagon Alley, which is connected to Hogsmeade via the iconic Hogwarts Express. Both parks have been massive feats of creative and engineering innovation, built to replicate the Harry Potter universe in the movies to a staggering level of detail—and they're filled with Easter eggs for fans to discover. 1. Many Wizarding World staff members are from the UK. The park hired a large number of its team members directly from Britain in order to make the experience as authentic as possible. Additionally, every member of the staff was made to take an exam, testing their knowledge of the books and the movies to make sure their interactions with the guests would be as seamless as possible. 2. The executive chef at Universal Orlando spent three years creating the park's menu. J.K. Rowling’s writing directly inspired every dish served at the Leaky Cauldron in “London” and The Three Broomsticks in Hogsmeade. The author herself even had the final say on the Butterbeer recipe served in the parks. Though in the books the beverage seems to be slightly alcoholic, it’s a frothy, kid-friendly drink in Orlando. 3. Arthur Weasley’s car makes a cameo appearance. Waiting in line for the Dragon Challenge roller coaster, just as you cross the bridge and enter the castle, you can get a glimpse of Arthur Weasley's flying Ford Anglia, which Ron and Harry crashed into the Whomping Willow in Harry Potter and the Chamber of Secrets. 4. There are interactive sites hidden throughout Diagon Alley where visitors can do magic with their wands. One of the new features in the Diagon Alley expansion was the addition of wands that interact with the park, allowing visitors to cast spells if they say the right words while standing in the right spot. A map that comes with wands from Ollivanders will display the spell locations if held under the black light in Knockturn Alley—but the creators of the park also included some secret sites, unmarked on the map, where the right waving of a wand can create some special effects. 5. A Crumple-Horned Snorkack can be seen in the Magical Menagerie store. On the second story of the Magical Menagerie, you can catch a glimpse of the Crumple-Horned Snorkack, Luna Lovegood’s oft-mentioned favorite magical creature. Rowling later said that Luna became a famous naturalist who discovered many creatures—but "she never did find a Crumple-Horned Snorkack and had, finally, to accept that her father might have made that one up." The colorful, purple representation is as close as muggles and wizards will ever get to seeing what a Snorkack looks like. 6. The sign for The Leaky Cauldron actually leaks. In the books and movies, this London pub serves as a gateway between the muggle and the magical world. At Wizarding World, there's a small touch of that magic visible from the street: the Leaky Cauldron sign is perpetually leaking. 7. There are house elves all over both parks. If you look into the rafters of The Three Broomsticks in Hogsmeade, you can see the shadows of house elves dancing, presumably on break from preparing and clearing the food. In Diagon Alley, there’s a House-Elf Placement Agency storefront, and a statue of a house elf holding a lantern up on one of the buildings. Kreacher, the Black family’s servant, makes an appearance from behind the curtain of 12 Grimmauld Place every couple of minutes. 8. Harry and Hermione might sound a little different on one ride. Although Harry Potter and the Escape From Gringotts features appearances from original actors such as Ralph Fiennes, Helena Bonham Carter, and Rupert Grint, neither Emma Watson nor Daniel Radcliffe reprised their roles as Hermione and Harry for the immersive, three-dimensional ride that chronicles their escape from the wizarding bank that took place in Harry Potter and the Deathly Hallows. 9. Moaning Myrtle can be heard wailing from the bathrooms in Hogsmeade. In the books and films, Moaning Myrtle usually restricted herself to the girls' bathroom—but in Hogsmeade, patrons of both the men's and women’s bathrooms can hear the ghost whining and crying. 10. Visitors can catch a glimpse of Voldemort in front of Malfoy Manor on the Hogwarts Express going to Diagon Alley. A shadowed figure in long robes can be seen just quickly as the train passes Malfoy Manor, the home of Harry’s school nemesis and where Harry and Hermione were taken after their capture in Deathly Hallows. 11. Diagon Alley contains a subtle tribute to the Jaws ride. In order to build the Wizarding World expansion, Universal Studios did away with the boat ride that brought riders face to face with Steven Spielberg's shark. As a tribute, a record is visible in the windows of the shop on Charing Cross Road, right next to The Leaky Cauldron: The Quint Trio, with a song called "Here’s to Swimmin’ with Bow Legged Women" (a quote straight from Jaws). There’s also a set of shark teeth in Mullpepper’s Apothecary. 12. While in line for The Forbidden Journey, you can hear a teacher lecturing Neville from the other side of the Potions classroom door. The line for The Forbidden Journey, which guides guests through the Hogwarts grounds and castle, is almost as magical as the ride itself. Along with moving paintings and iconic pieces like the Mirror of Erised, the creative team included a few less-obvious touches for fans to enjoy—like the voice instructing Neville Longbottom how to properly cast a spell. 13. There’s an actual London-style phone in the King’s Cross section of the park. Just like in Harry Potter and the Order of the Phoenix, if you dial 62442 (MAGIC) you’ll be connected to the Ministry of Magic (although it seems that the engineers behind the park haven’t figured out a way to actually bring you there yet). 14. You can hear a bird chirping from inside the Vanishing Cabinet At Borgin and Burkes. Draco Malfoy used a bird to test whether or not he could sneak Death Eaters into Hogwarts using the Vanishing Cabinet in the Room of Requirement. Visitors who head down Knockturn Alley and into Borgin and Burkes can hear a faint chirping from inside the magical piece of furniture. 15. The Hogwarts Express was built to look well worn. Both J.K. Rowling and the film series’ production team were consulted throughout the design process to make every part of the parks as detailed as possible. The Hogwarts Express, which carriers park visitors from Hogsmeade to Diagon Alley, was built in Switzerland—a nation famous for meticulously perfect mechanics—and was artificially aged to make it look as though it had made the journey from Hogwarts to London thousands of times. 16. The London Symphony Orchestra recorded new musical arrangements for Escape to Gringotts and the Hogwarts Express. The same musicians that recorded the soundtrack for the films were used to play the new arrangements for the park attractions, which were recorded at Abbey Road Studios in London. 17. J.K. Rowling wrote the titles of every song Celestina Warbeck sings in the park. A stage in Diagon Alley hosts puppet reenactments of The Tales of Beedle the Bard and performances from the biggest pop star of the wizarding world, Celestina Warbeck. Every song she performs is an original written from one of the titles J.K. Rowling mentioned in the series. According to the author, Celestina recorded the anthem of the Puddlemere United Quidditch team, “Beat Back Those Bludgers, Boys, and Chuck That Quaffle Here” to raise funds for St. Mungo’s Hospital. Molly Weasley listens to the singer on the radio every Christmas, and a few lyrics of “A Cauldron Full of Hot Strong Love” were even mentioned in the books. 18. The entrance to Diagon Alley is through an unmarked wall next to a record store—just like in the books. Normally, a theme park that wants to attract millions of guests would create an entrance that’s open and obvious. But the creators of these parks wanted the Wizarding World experience to be as authentic as possible—even if that meant an entrance to Diagon Alley that’s meant to be invisible to muggle eyes. 19. The perfume advertisement in King's Cross Station is not quite the same as the ad that appears in the opening sequence for Harry Potter and the Half-Blood Prince. In the sixth movie, Professor Dumbledore makes his dramatic appearance in front of a banner that reads “Tonight make a little magic with your man.” The slogan on the billboard in Orlando is a little pithier and less suggestive.